Golden Tram 242 Lisbon Hostel is located in the midle of old lisbon downtown. The building was built in 1922 and has been completely refurbished to become the best Lisbon hostel, with 1.000 square m2 spread over 5 stories, has 16 rooms, 4 en-suites included, with private full bathroom, 124 cabin special bunk beds and 8 twin beds, Totalizing 131 Dorms, 8 changing bathrooms (male/female), with 31 cabin showers, 44 lavatories and 15 bathrooms divided by (m/f)all situated from 1º floor to 5th floor. The Golden Tram 242 Lisbon Hostel is a non - smoking hostel, also totally equipped against fire risks. We cater a coffee shop bar/living room in the 1º floor, all day dinning: free breakfast, Portuguese finger food tapas specialties, snacks, lunches & dinners. At weekends will have special animation/entertainment programmes: fado songs,Latin dancing and Portuguese gastronomy cooking nights. We offer competitive f&b prices, with great value for our guests money. Located in Lisbon (Bairro Alto), Portugal Ways Santa Catarina Suites is within a 15-minute walk of Rossio Square and Santa Justa Elevator. 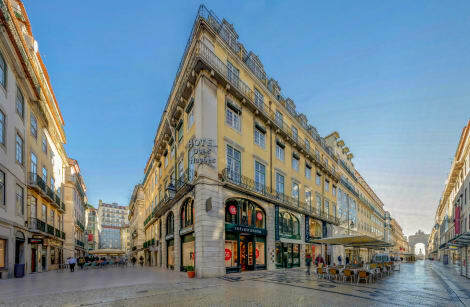 This hotel is 0.6 mi (1 km) from Lisbon City Hall and 1 mi (1.5 km) from Commerce Square.